Justin Rose was among the early starters on Saturday to take advantage of the easier conditions, tying the Carnoustie scoring record in an Open with a seven-under 64. Justin Rose needed to birdie the final hole on Friday to make the weekend on the cut line at the 147th Open. Off in Saturday’s third group, he shifted his mind-set and took advantage of the morning’s early, calm conditions as he played his way back in to contention. With fairly mild temperatures and winds around 5mph, Rose produced just the second bogey-free round of the tournament with seven birdies to get to within two shots of the leaders at the time. Since then, Spieth, Kisner and Schauffele pushed ahead to get to nine-under-par, leaving Rose five shots behind the leaders. “I felt like it was a beautiful morning to play golf,” Rose said. “I felt like it was an opportunity to score well out there. The highest ranked player left in the field got off to the perfect start with a birdie on his first hole of the day, adding another at the par-five 6th as he crept back towards red figures. But it was on the closing nine that he got in to a rhythm with his putter, picking up a shot at the 10th before making back to back birdies on the 13th and 14th, as well as on the 17th and 18th holes. 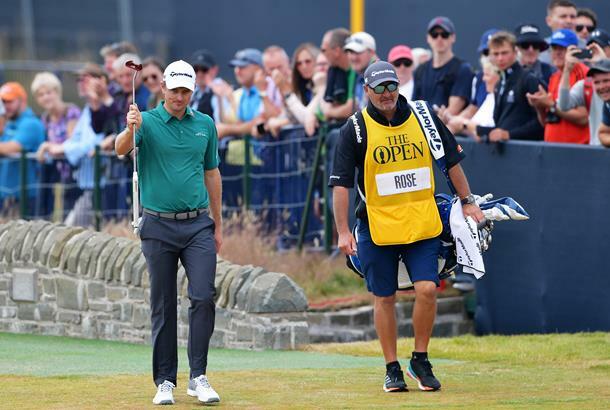 Rose had just 25 putts on his way to a 64, which ties the lowest round in an Open at Carnoustie – but the Englishman still felt he left some opportunities out there as he finished one shot shy of tying Tommy Fleetwood's course record of 63. “There were some opportunities that slipped by on 2, 3, 4, 5, I felt, but birdieing 6 was the first birdie I've made on a par 5 all week. Just doing the simple things better today. Taking advantage of the holes I should take advantage of made the round much easier." It's now a waiting game for Rose, who acknowledged that with benign conditions it's likely he'll be a lot further away from the lead than two shots by the end of the day. "I think that, if the conditions were to turn and it began to play much more difficult and they realise that 6, 7-under par is not really in the realm this afternoon, it could lead to frustration more than pressure, I think." "But no, I think at this stage. It kind of shows them what's out there and gives them the intention that they need to look for birdies rather than play it safe." In other notable rounds this morning, Patrick Reed, Jason Dufner and Ross Fisher all carded three-under 68s to move back to level par for the tournament, while Yusaku Miyazato ended his day just one shot worse than Rose - posting a bogey-free 65. Meanwhile, England's Chris Wood looked to be on course to go even lower than Rose before a couple of late bogeys on the back-nine dropped him back to three-under-par. Wood had at one staged moved to just one shot behind the leaders thanks to seven birdies in his opening 13 holes, but after taking two to get out of the bunker on the par-five 14th and dropping a shot, he failed to move any closer. He added a further bogey on the par-four 17th hole and looked to be in trouble on the last as he found himself putting next to the fence by the green. His first attempt wasn't brilliant, but he holed a huge putt final to guarantee a par and a third round of 65.